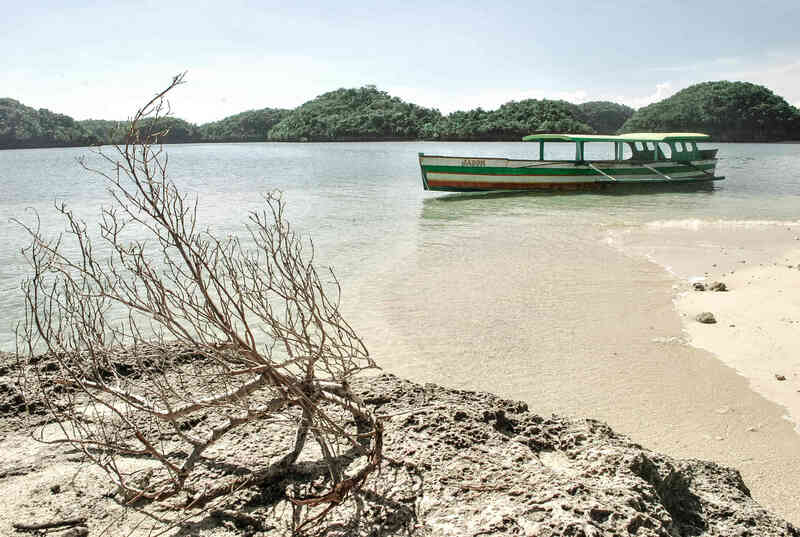 Riddled by 123 islets spearing out of the cerulean sea, Alaminos in Pangasinan beckons intrepid travelers and pleasure seekers. 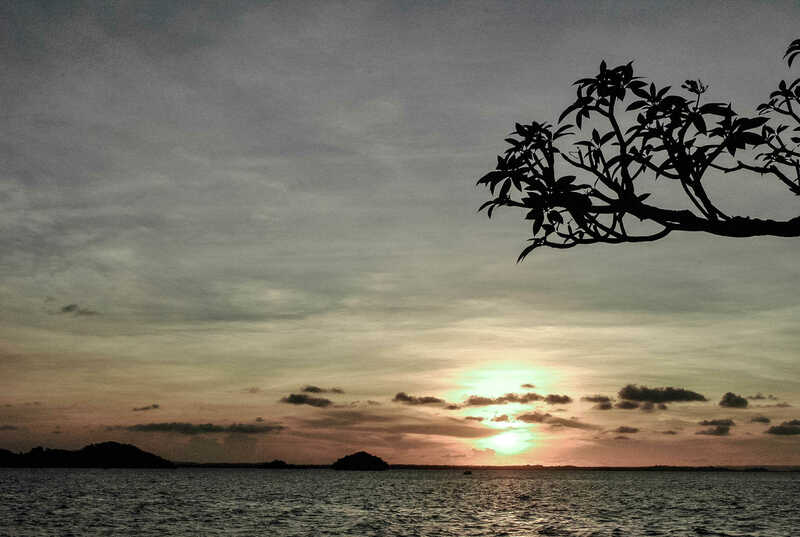 Home to a staggering variety of wildlife and fishes, these coral islands are collectively called HUNDRED ISLANDS. Most of them are desolate, save for the 4 major developed islands: Governors Island, Quezon Island, Marcos Island and Children’s Island. 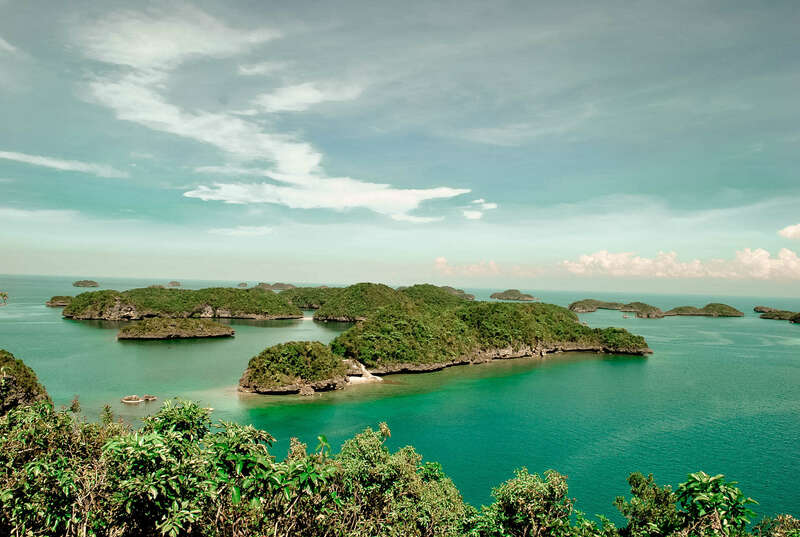 *For an updated HUNDRED ISLANDS TRAVEL GUIDE –> CLICK HERE. Ride a bus bound for Alaminos, Pangasinan, try Victory Liner in Cubao, fare is about Php 400 if coming from Manila. Travel time is 3-4 hours. Once you reach Alaminos, head to Lucap Terminal where tricycles can take you to Lucap Wharf the jump-off point for island hopping, fare is Php 15 per person, however it only leaves once full. Alternatively, you can charter a tricycle all the way to Lucap Wharf. At Lucas Wharf, you need to register and pay the Hundred Island Park Fees. If you’re only going to do a day tour, fee is only Php 20 while Php 40 for those who plan to stay overnight at any of the islands. If you’re up for more adventures at Hundred Islands National Park, rent a kayak for Php 250 per hour (good for 2 persons) and go canoeing from one island to the next! You can also snorkel and explore the colorful marine life! Snorkeling gears are for rent for Php 100. Other camping supplies like grills, coolers and mats could also be rented out. For those planning to rough it up, camping at Hundred Islands is recommended. Fee is Php 200 per night and tent rental is Php 400. To save on the tent rental fee, bring your own tent. 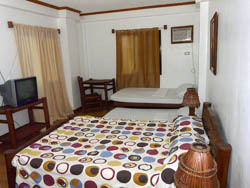 You can also rent a cottage with rooms or open cottage starting at Php 300. 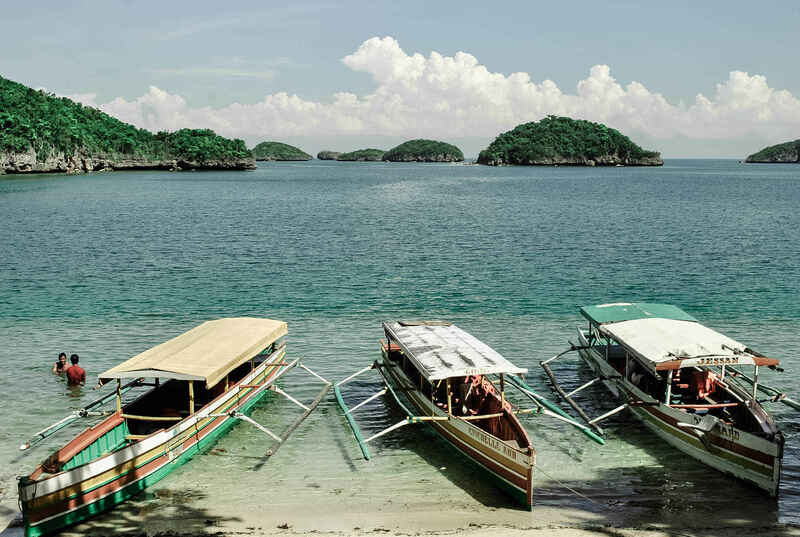 Alternatively, you can do a day tour of the Hundred Islands and find budget hotels in Alaminos instead. We stayed at Islandia Hotel and Island Tropic Hotel. my friends and i want to go on a day tour and we are coming from manila. any suggestions on the best time to leave manila so that we can maximize our island hopping and snorkeling activities? also, id like to know if mas makakatipid kami if we make our own itinerary (commute, rent boat and snorkels and scout for accom) instead of getting a package tour? is it more expensive during summer? Thank you for the detailed information on how to get to hundred islands. We already booked a trip for baguio via cebu-clark. We are planning to drop by the island before going to Baguio on Oct. 28 next year. Your blog is very informative. I am following you in twitter. About dun sa tent for rent na P400, good for how many persons siya? Ung 1k b pra s boat rental,blikan nun? We would LIKE to discuss a day tour. Can you tell us if the day tour boat would also cover the trip around the islands and would let us do the swimming and snorkeling in some of the perfect sites? Thank you very much for these details! Very informative! I love all your travel reviews! Keep inspiring us! :* Thank you! Yep. Roundtrip. Yes, you can just pitch a tent. May I know the contact number? We’re planning to go here in Holy Week. Hi Good Day! Yung boat po ba eh glass bottom boat? no. regular wooden outrigger boat. Hi Maam! we will travel by private car, possible to enter and leave our car sa Lucap Wharf? Thank you. Regarding the Hundred Island Park Accommodation you posted above, is it at the island talaga or sa Wharf? Saan po ako pwede makapagpareserve for the said accommodation? Sa Island. I don’t have the contact number. I’m sorry. Hello. yung boat po ba service boat na? good for how many pax ang isang tricycle? Pwede po kaya ung may ksamang bata pag sa boat ride? Yes, just make sure may life vest na kasya sa bata ha. Updated po ba mga rates dito as of this date? A reader just commented, hindi daw. They increased ata. It seems that the overnight fee is the day tour fee na. I’ll ask a tour guide and update this. The rates for boats posted in internet is very different when u get there in hundred islands park.we were so disappointed beacause were expecting that the rates are same in the internet.we planned to have the day tour but instead they charge us for an overnight fee.we complained about it but it seems they dont care,its their way of catchin people to go there and u cant do anything but to grab their “new rates”..we hope that the dept.of tourism here in hundred islands will pay attention.pls post the rates regularly to avoid conflicts regarding with the prices..
Hi, yung boat rates po ba is per person? Yung bayad po ba ng boat na yun eh bayad na for the whole island hopping?ilang island ang pwedeng puntahan for that day tour? yes, better to rent another one. You can verify there na lang. Hi!! I just have a question regarding the accommodation in hundred islands itself. Do they have a website where i can check the rooms and the rates? And on what island they are situated in? Thank you! This blog is really cool and we’ve gettng alot of ideas planning our next rampa… just want to ask about the boat rental, is it possible to get one as a joiner.. or do we have to rent it on our own.. cause we do love to travel cheap and the goal is spending less and getting more… any info about the boat rental will be much appriciated … thanks.. more rampa and power to you..
Pwede ba ang 1 year and 7 months na baby sa island hopping sa boracay? Hmmm. I won’t recommend that. You can go for the tricycle tour or just swim na lang sa White Beach po. hi po from island tropic hotel mag boboat pa po b pa hundred island? how much po yung balikan ?